Almeria is the easternmost of the Andalusian capitals, with a coastline of unspoilt beaches and an interior marked by peculiar semi-desert ecosystems. This city has the advantage of being connected in a fairly direct way with the main cities of Spain and its airport is located only a few minutes from the capital of Almeria. The best way of getting around Almeria and the surrounding area is the car. Car Hire in Almeria is very recommended if you don´t have your own means of transportation. When you plan to stay for a few days, a car is very useful for visiting beautiful off-road beaches in the Cabo de Gata Natural Park or exploring the desert landscape in the interior. Almería airport is located at Nijar road, 8 km from the capital and 10 minutes by car (rent a car at Almeria airport) via the motorway. The airlines flying from / to Almeria are: IBERIA and PAUKNAIR flying to Madrid, Barcelona, Melilla and Malaga. CONDOR, LUFTHANSA, HAPAG LLOYD, AERO-LLOYD and GERMANIA, with flights to Stuttgart, Nürnberg, Munich, Frankfurt, Leipzig, Hanover, Düsseldorf, Hamburg, Dresden and Berlin. BRITANNIA, AIRTOURS, TLA and MONARCH offer flights to London, Belfast, Birmingham, Dublin and Manchester. SOBELAIR and VIRGIN offer flights to Brussels. FINAIR is flying to Helsinki. TRANSAVIA is flying to Amsterdam. AIR LAURA with flights to Vienna. LOT offers flights to Warsaw. To reach Almeria by road, you have several options: If you come from Seville, you only need to take A-92 which takes you directly to Almeria, as this motorway crosses Andalusia from west to east. The distance is 410 kilometers. Coming from Madrid, you take the A-4 or Autovia de Andalucia and the A-92. The distance is 552 kilometers. Coming from Málaga, you can travel straight on the national road N-340; another option is to take the A-92 in Granada (the distance for the N-340 is 230 Km). Coming from the Spanish Levant, (Barcelona, Costa Brava, Alicante, Costa Blanca) you take the E-15 or the AP-7 (Autopista del Mediterráneo) to head south. Visiting the city, if you arrive by car it is best to leave it parked in the first place you find and head for the Alcazaba. The castle dates from the 9th century and is the largest in Andalusia. From the castle you can enjoy magnificent views over bay of Almeria. At lunchtime, a good idea is to take the car and go to a typical seaside village; that way you can observe and appreciate the unspoiled coastline. Almeria offers visitors a wide range of monuments, buildings, towers and churches that invite us to know the history of the city: The Alcazaba, the castle of San Cristobal, the Cathedral, Hospital de Santa Maria Magdalena, Convento de Concepcionistas, Convento de Santa Clara, Convento de Santo Domingo, parish church of Santiago, Casa de los Puche and the Railway station. Almeria has several beautiful green spaces where to a stroll below the shadows, such as the Parque de la Almadrabilla, the Parque del Boticario and the Parque Nicolás Salmerón. Very close to the city is the Natural Park of Cabo de Gata. It is a park of volcanic origin and the largest protected marine-terrestrial space of ecological relevance of the whole European western Mediterranean. Being one of the most beautiful coastlines of ecological wealth along the western Mediterranean, the Natural Park of Cabo de Gata has become one of the gems of nature for tourism in Almeria, Andalusia and Spain. 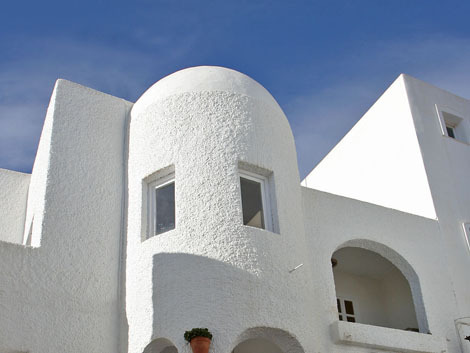 The rich craftsmanship of La Alpujarra results of their cultural and traditional heritage. Outstanding are pottery, rugs and carpets, basketry, embroidery and wicker. Alpujarra tissues are most famous since the Moorish epoch. The town of Nijar has been a major center for pottery in Andalusia and is characterized by its multicolored glazed pots. In Macael can be found handmade marble items; in the municipality of Níjar you can find one of the most famous craft products of Almería, the rugs; and in Mojacar and other villages in the province, necklaces, earrings, cameos and other jewelry made with red coral. Semana Santa (Easter week) in March or April; Cruces in May; Certamen Internacional de Guitarra Julian Arcas (International guitar contest) in May; fair of Virgen del Mar in August; Moorish games of Aben Humeya in the municipality of Purchena (an historical-sportive event in the Moorish style with music, dance, souks and samples of north African cuisine). La Cueva: Live music, good ambient and excellent music (Calle Canon Molina Alonso). Vertice: Rocker, dark and very central place (Eduardo Pérez). Amargo Sound Cafe: Large, central, techno (Plaza Marqués de Heredia). Malevaje Alcohol Club: Live music (Calle Doctor Aráez Pacheco). Disco Rialto: With two dance floors, house on Saturday and electro on Friday (Calle Ramon y Cajal). Almeria has a large urban sea promenade with excellent service. The area is very lively and frequented by many Spanish families. A few kilometers from the city you will find magnificent beaches very near to the Natural Park of Cabo de Gata. 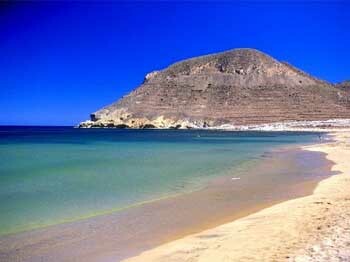 During the summer months try and do your sightseeing in Almeria before the heat in the afternoon. Do as the locals and enjoy a stroll in the soothing evening breeze along the seafront, the parks and shopping streets. You can finish your stroll in the Almeria old town and end the evening dining at one of its great restaurants.